The road to Shu is hard, harder than climbing to the sky. Pound cliffs, boil over rocks, and thunder through ten thousand chasms. I’ve always been big on hidden paradises. Right from the lonely little lake in a mango grove in my native Bihar where I spent many solitary afternoons to Dung Lung Dor in Satyajit Ray’s Eko Shringo Abhijan (The Unicorn Expedition) to Oz and El Dorado; I wanted to see them all, if only a glimpse. These places had their rules. You would never find them on a map, at least not a real one; you’d have to endure many hardships; and you could never hope to reach there without a large amount of grace. Over the years I’d been to some unimaginably lovely places, and lonely places, and places that could well have been Faerie. But then, last year, I went to Nanda Devi. The goddess’s secret garden has held sway over me for what seems like forever. A few years ago I’d chanced upon an excellent book by the journalist Hugh Thomson called Nanda Devi: A Journey to the Last Sanctuary. This led me to Eric Shipton’s classic Nanda Devi, an extraordinary book that has to be one of the most romantic mountain travel books ever. In 1934 Shipton along with his partner Bill Tilman and three of the best sherpas of the day spent the summer, monsoon and autumn wandering about central Garhwal, living off the land and accomplishing some unbelievable mountaineering feats, the biggest of which involved finding a way into the Nanda Devi sanctuary, an impenetrable mountain fastness that had repelled all earlier attempts by locals and mountaineers alike. I’d been dreaming ever since, and through a convenient coming together of luck and circumstance, I was finally going there, to pay my respects to a great mountain. The Nanda Devi Sanctuary lies across the Great Himalayan Range in the form of a cirque of high mountains in the centre of which sit the twin peaks of Nanda Devi, looming over some 380 sq km of ice and snow. Nowhere, in its 110 km length, is this mountain wall less than 18,000ft high. At a single point in this chain, the Rishi Ganga cuts a frighteningly deep gorge through the mountain barrier and flows west to meet the larger trans-Himalayan Dhauli Ganga. The only practicable route into the inner reaches of the sanctuary is by outflanking the outer gorge of the Rishi Ganga by crossing the 4252m Dharansi pass to the hanging valley of Dharansi and then down to the upper Rishi Ganga gorge. My friend Parth and I arrived at Lata on a sunny day in early September- the final day of the annual Nandashtami festivities. Originally a tribal nature cult, to outsiders Nanda is just a stand-in for Parvati, but to the Bhotias, just as to the rest of Garhwal and Kumaon, Nanda is herself, the powerful queen of her mountain realm, the bliss-giving goddess. In an old temple in Kumaon, Nanda’s image is that of a tribal woman. Many are her legends, too numerous to put down here, but the entire area is consecrated to her- the forests and the animals are her children, as are the Bhotias, who celebrate the end of the monsoon harvest season with nine days of songs and dancing, ending in the ritual sacrifice of rams in honour of the devi who inhabits the body of her priest to bless the day with her presence. We caught the final day’s rituals before Nanda was carried back to her temple from an antechamber where she had been residing the past few days amidst great fanfare and rejoicing. It was one of the few truly animist rituals I’d ever seen. The stone Nanda temple dominated a courtyard, studded with bramha-kamals to mark the occasion. 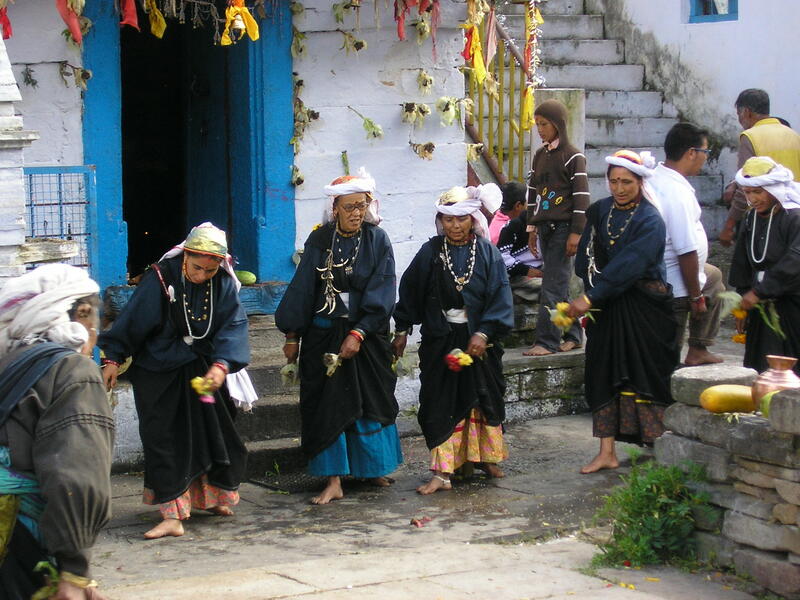 Women in Tibetan-looking long black robes and white cloth headgear danced slowly in a circle while chanting a plaintive song of regeneration and permanence. Then the spirit of Nanda’s deputy, the trickster god Latu, invaded the body of a designated medium. Latu lurched around the compound to frenetic drumming, tasting all the fruits of Nanda’s bounty- from sheep’s heads to barley. Then he flung the rest of the prasad into the delighted crowd, who took what they could. Then Nanda herself entered the body of her priest, who, dressed in her ceremonial regalia, blessed the villagers and two large rams brought as offering. These were then summarily sacrificed. The sun gradually sank to the west, and the puja was over. The children of the village who’d been waiting patiently all this while swarmed up the walls of the temple, clambering up with the agility of sure-footed cragsmen to get at their prize- a bramha-kamal. Narendra of Mountain Shepherds, my guide, is a charming young man in his mid-twenties. We stayed at a modest home-stay that he runs for his father Dhan Singh, the former village sarpanch. Dhan Singh and his friend Raghubir Singh were much-feted guides in the hey-day of mountaineering in the sanctuary in the 1970s. It was in Lata and the nearby village of Reni that the famous Chipko movement began in 1974 to prevent the felling of sacred deodhar groves by forestry contractors. Since the closure of the sanctuary in 1982 for environmental reasons, a generation of Lata men had lost out on a lucrative source of income, especially since the 1962 war had terminated their earlier trade with Tibet. Dhan Singh, who was a young man during the Chipko movement, organised the villagers of this area into an effective body of activists during the Jhapto Cheeno movement in the late Nineties in an effort to get back their land that was shut to them with the advent of the National Park and it’s subsequent notification as a World Heritage Site. Its success led to more elbow room for the Bhotias, and now a few trails were allowed to be kept open in the national park for small groups of trekkers with permits. Men from Lata and the enarby village of Suraithota acted as guides. We were to leave the next day, with Raghubir Singh and Narendra acting as our guides. 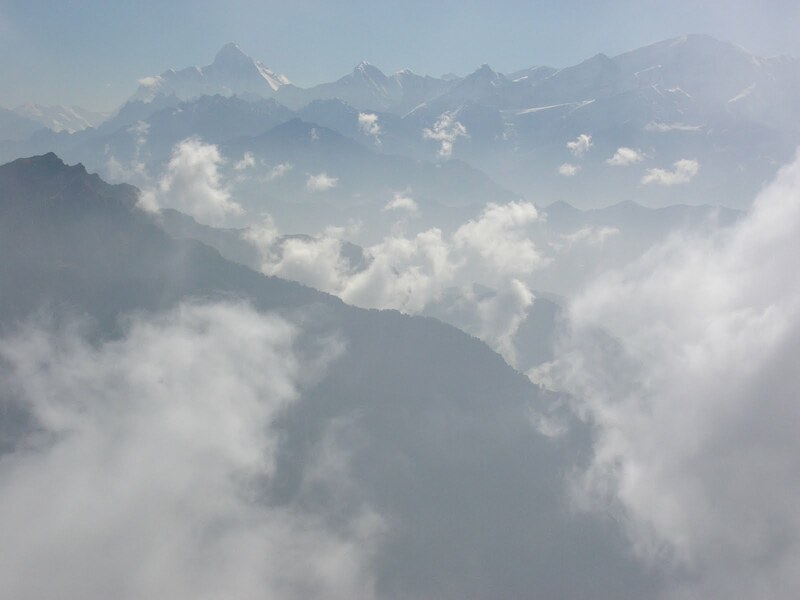 Great post, and most interesting to a number of us who also love Nanda Devi. We have just got back from Kumaon, where we trekked around the villages with an outfit called Village Ways. From north of Almora we could see Nanda Devi, perhaps 40K away, but still magnificent. 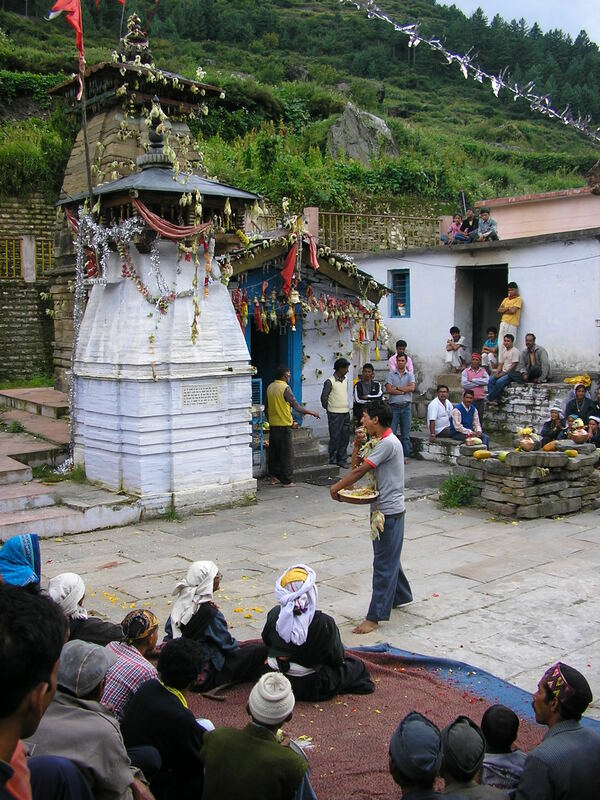 We were there at Holi, and saw the village women dancing and singing to the Godess – Nanda Devi. The local men also danced on a different day, and to another local deity, Golu. I’d be happy to uplod some pics of all this, but not sure how to do it. I’d love to see your pictures. I think you could put them up as a post or maybe on Picasa.